Conn. General Statutes (CGS) 11-25a, 11-31a, 11-31b, 11-31c. Regulations of Conn. State Agencies, Sec. 11-31c-1, 11-31c-2, 11-31c-3, 11-31c-4, 11-31c-5. "borrowIT CT" (formerly known as Connecticard) is a cooperative program among public libraries in Connecticut that allows a resident of any town in the state who holds a valid borrower card issued by their home library to use that card to borrow materials from any of the 192 public libraries participating in the program. Using their hometown cards, non-residents may borrow any of the materials that participating libraries lend to their local borrowers. Participating libraries are reimbursed for these loans by the CT State Libr ary. The budget for FY2019 is currently at $703,638. Monthly Report - Form for reporting loans by your library. Statistics and Payment Information - Payments, loans, borrows, net-plus, etc. Regulations - All libraries should be familiar with these rules. The formula for determining grant amounts is included in the state statutes. Payments are made annually. One-half of the total funds appropriated is used to reimburse participating libraries for all reported borrowIT CT loans. The other half is used to make an additional payment to those libraries that loaned more items to non-residents than their resident card holders borrowed from public libraries in other towns. borrowIT CT grant payments MUST be spent by the library and may not revert to the general fund of the municipality. See this MEMO to Municipal Fiscal Officers (PDF) for more detail. Find out your most recent and previous years' borrowIT CT payment information. End of February - The borrowIT CT reporting year ends. Mid-March - Deadline for submitting borrowIT CT lending reports for the preceding year. 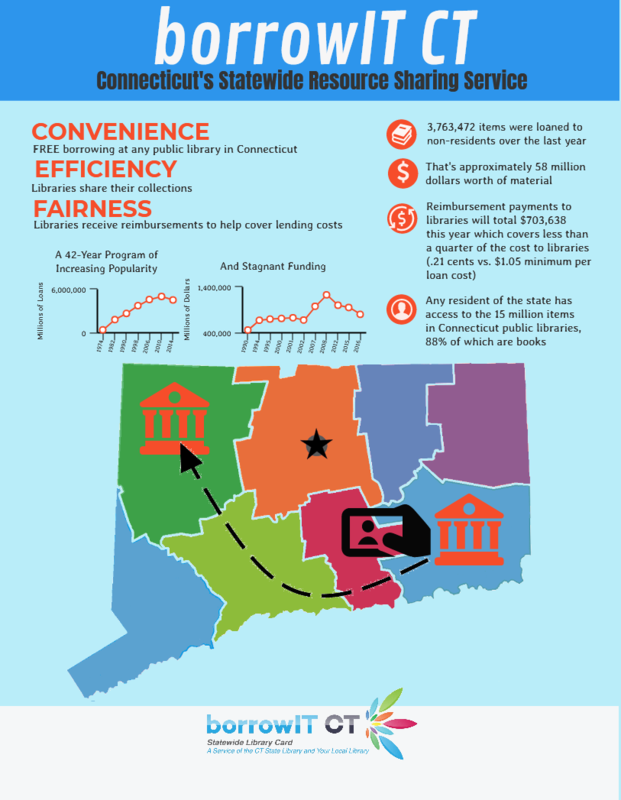 April - State Library issues a report showing the borrowIT CT loans, borrows, and payments at each public library during the previous reporting year. April/May - Libraries receive borrowIT CT reimbursement payments. November 1 - Deadline for completing borrowIT CT Expenditure Reports for the payment made approximately 18 months earlier.